Survived 2 cracked Giro helmets. so prefer to stick with Giro v. other manufacturers' helmets. This time I went with MIPS, which was just on the market at time of purchasing previous Giro Synthe. 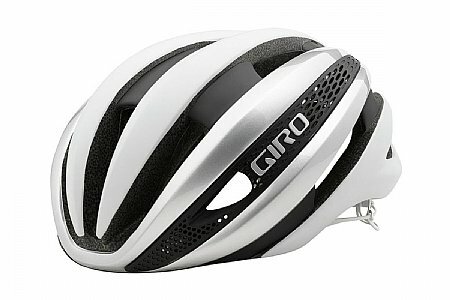 Giro offered 30% off due to cracked helmet, but off their escalated retail price, higher than MSRP listed elsewhere. Bike Tires Direct offered best deal. Not only was helmet on sale, but regular price was nevertheless competitive with other online vendors. Adding VIP appoints to sale price it was a steal,clearly the best way to go. Hi, I've had this helmet-in all black-for a few months and I've really enjoyed it's quality. It's very breathable and comfortable. If you happen to be considering buying one, I have no regrets with my purchase of it, and if you do get one, you shouldn't have any regrets either. Did a lot of research on road helmets and this particular one is at the top. Fit and adjustments is outstanding. Ventilation is amazing. Aerodynamics again is at the top. I am really glad I made the purchase and would recommend for serious riders. This helmet stays put and does not ride back on my head. I use this helmet on road and gravel rides. This is the most comfortable helmet I have ever owned going back over 20 years. I wear a large Giro Synthe MIPS Helmet, and my hat size is XL or 7 58 - 7 34. I have had a problem in the past with helmets riding back on my head and exposing my forehead. I do not have that problem now and the helmet stays down and protects my forehead. I like the style look of this helmet. I always wear a cycling hat and they integrate together nicely. If I had to purchase another helmet, this would be the one. Perfection. Best helmet I have owned. Lightweight. Cool. Great airflow. Great helmet for south GA heat. Best helmet I have owned. This was a replacement mips helmet. I had a POC MIPS Orange helmet that was compromised on a charity off road event. This helmet fits better, and feels like you are not wearing one. Bought the yellow which has great visibility. Had not had a Giro helmet for many years. I am a fan again! I love the helmet. I can barely tell it is on, very comfortable and light. Use it every time I ride bikes, lite weight, cool when using, adjust ease, looks good.